The CEOs of Paycom, Shopify, and Under Armour have a lot riding on the success of their companies, and that could make these stocks worth buying. Paycom Software (NYSE:PAYC), Shopify (NYSE:SHOP), and Under Armour (NYSE:UA) (NYSE:UAA) are very different companies, but they do share one thing in common: They're all run by visionary founders who own hundreds of millions of dollars in company stock. Because these entrepreneurs have a lot of their net worth tied to the success of their companies, I think investors ought to own shares, too. Paycom may compete in a market dominated by established payroll processors like Paychex and ADP, but it has the advantage of being built from the ground up for today's access-anywhere world. As a result, small and midsized business are flocking to the provider of human resource solutions. The company's founder is Chad Richison, who created Paycom after realizing that stodgy prior-generation payroll providers were missing the boat when it comes to serving next-generation start-ups. Today, Paycom counts more than 17,800 clients, and Richison's 13%-plus stake has grown to be worth about $460 million. While Paycom has made incredible headway into this market, it's arguably still early innings. According to the Small Business Association, there are about 28 million small businesses in the U.S., and they're creating the majority of new jobs in the country. Yes, it's unlikely that Richison will convince all of them to sign on with Paycom, but his message has resonated with enough businesses already to make me think that underestimating him isn't smart. 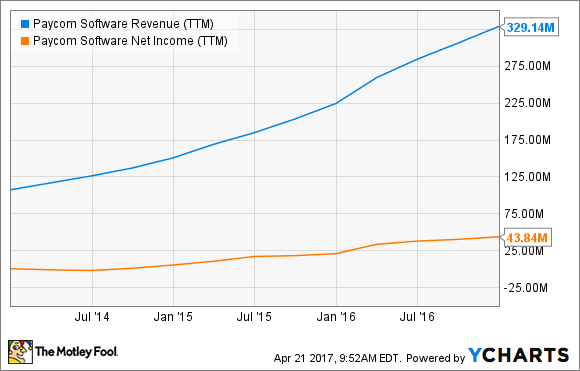 PAYC Revenue (TTM) data by YCharts. What do snowboarding and internet retail have in common? Not much -- unless you're a young snowboarder intent on creating an online store to sell equipment, and you realize that current web solutions fall short. After being disappointed by existing online retail solutions, snowboarder-turned-entrepreneur Tobias Lutke founded Shopify as a soup-to-nuts provider of retail solutions that help retailers market, sell, and track their wares. Lutke still owns about 8 million shares of Shopify (plus options to another 1 million shares), and in my view, that's a great place for him to be stashing his net worth. At current prices, his stake is already worth about $600 million, but it could grow to be a whole lot more. If you need an online storefront, Shopify can help. Want a company to handle payment processing? Check. Need software solutions that analyze customer data and inventory? Yup. Want a seamless mobile shopping experience? Well, you get the point. Shopify's already providing these and other services to hundreds of thousands of retailers worldwide. But it's not just a great lineup of cloud-based retail solutions that makes this an exciting stock to own. It's also the company's cash-flow-friendly business model that makes it appealing. Shopify collects monthly subscriptions ranging anywhere between $29 to $299 (more for big retail partners), and it pockets a little bit from every transaction it processes on its platform. Its approach means that it has a steady source of recurring revenue, and the potential to make more money as its customers' sales grow. That's a win-win! Given e-commerce sales still only represent about 8% of total retail sales, this company could be much bigger 10 years from now. Finally, we have Kevin Plank, who ignited an activewear revolution when he launched the now-iconic Under Armour brand. Under Armour is a customer-first company, and thanks to its focus on innovation, it has firmly established itself as a top-tier player in athletic apparel and footwear alongside adidas and Nike. It's also made Plank a billionaire given his 15% ownership stake. Despite its past successes, Under Armour's stock has taken an absolute drubbing in the past year, but I think the problems that have caused the company's shares to sell off are temporary. Yes, Under Armour's sales growth has slowed, but that slowing isn't due to the company shifting away from its devotion to great products. Instead, it's been caused by bankruptcies at key retailers, including Sports Authority. As hundreds of stores got closed, Under Armour's otherwise impressive track record for inventory management got tossed out the window. But I think the company's making headway on getting beyond the negative drag caused by bankruptcies, and ultimately, that devotion is what creates a loyal following. In my view, Under Armour's following remains among the most fervent out there, and because of that, I believe that once sales lap store closures, growth will reignite. Admittedly, I have no idea when Under Armour will regain its luster with investors, but since Under Armour is going to lap the quarters that were negatively impacted by bankruptcies this year, and Plank's got a lot of incentive to get his company back on the right foot, I think buying it on sale could be smart.